This is the documentation page of the Enliven WordPress Theme. We will try to keep everything well documented. If you are not sure about particular area of this please use the support forum. Theme installation process is same as others. Click on the Upload Theme button on the top. Use Choose File button to select the theme .zip file. Select the theme ‘zip’ file from your computer and click Install Now Button. After successfully installing the theme click “Activate Theme”. Activating Enliven Pro API Key. After the purchase, you should have received your API key to your email. If you haven’t got it please go to https://themezhut.com/my-account/my-api-keys/ and get your API key. Then please navigate to “Dashboard > Settings > Enliven Pro Theme Activation” to enter your API key and API email. After entering the details hit the “Save Changes” button. Adding a custom logo is very easy. Please use the following steps. Go to Customizer in the WordPress Dashboard. ( Appearance > Customize ). Upload Your Logo and Click Select in the upload screen. Just after the above setting there is a setting called “Display site title / logo”. Choose your preferred option from that setting. Click “Save and Publish” button at the top. After just installing the theme it will display the pages as the default menu. You can add your own links, categories, pages for the menu. In the edit menus tab click on the link “create new menu”. Give a Menu Name and click button “create menu”. Then you can choose/create the links from the three tabs(Pages/Links/Categories) which is in the left hand side. After Creating the menu select the Theme Location of the menu. (It’s under the Menu Settings which is in the bottom of the page. ) In this case tick the “Primary Menu”. – Adding a business homepage. Give the page a name whatever you want. eg : Home. 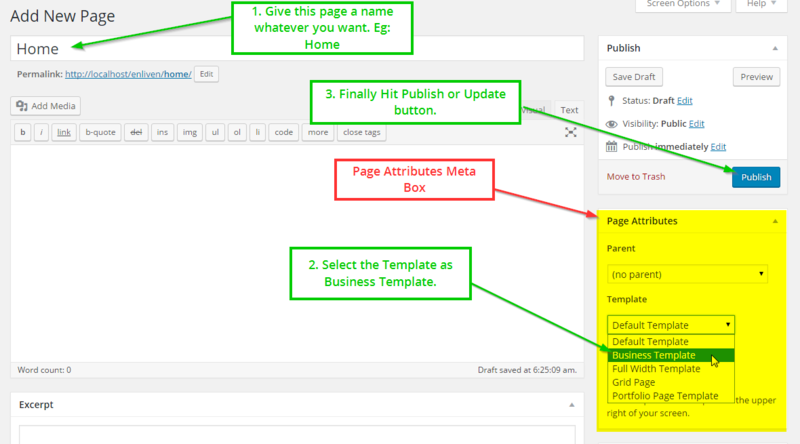 Then from the page attributes options box select the Template as “Business Template”. Then Go to Settings > Reading in the WordPress Dashboard and select the “A Static Page” option which is under the heading “Front Page Displays”. – Adding a blog post page when business homepage is activated. Go to Pages > Add New in the WordPress Dashboard. Give it a name whatever you want. eg : Blog. Then from the page attributes options box select the Template as Default Template. 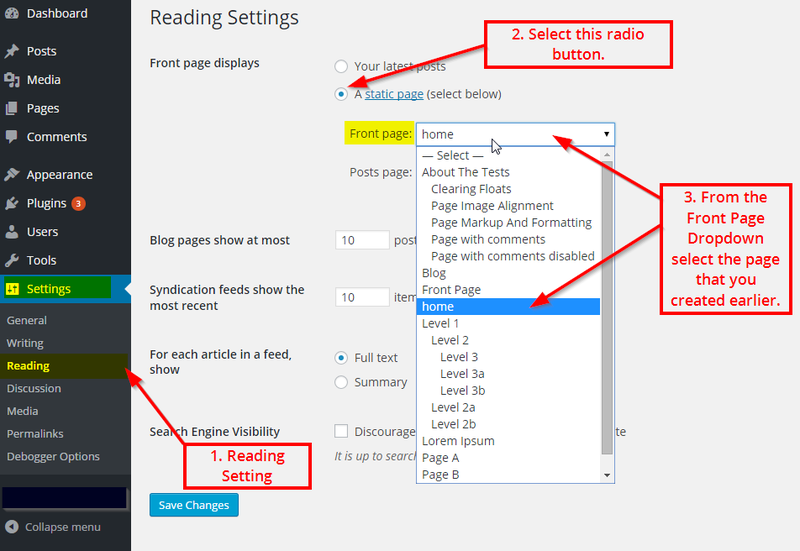 Then Go to Settings > Reading in the WordPress Dashboard and select the option “A static page” which is under the heading “Front Page Displays”. Then Select the page that you created, from the “Posts Page” drop down . eg: Blog. Watch this video to learn how to add a static homepage and use homepage widgets. If you have created a business homepage as described in the above section and if you are currently in that homepage from the customizer preview, now you are ready to use widgets. Go to Appearance > Customize > Widgets. If you cannot see the “Business Template” Widget area as displayed in the following screenshot you haven’t created your magazine homepage correctly or you are not in the homepage preview. 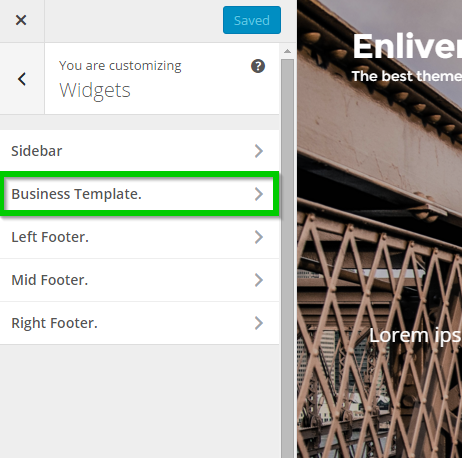 Now select the Business Template widget area and start adding Enliven Widgets and configure them to make your site as you like from the theme customizer screen. OR you can use Appearance > Widgets screen to drag and drop and configure your widgets in Business Template Widget area as follows. The advantage when using the theme customizer screen is that you can preview the changes you make. 1. Enliven: Icon Blocks widget. 2. Enliven: Call to Action widget. 3. Enliven: Featured Pages widget. This widget will display in the widgets area only if you have installed jetpack plugin and have activated “custom content type” module. This widget can be used to display your customer feedback in the front page. 6. Enliven: Featured Blog Posts widget. Enliven Widgets and Widget Areas. Enliven has included a full screen slider. To create slides, please create pages with featured images and select those pages for slider from “Appearance > Slider”. Then tick the “Activate slider on static frontpage” checkbox. If you want to display this slider on Blog Posts tick the “Activate slider on blog” checkbox. Watch this video to learn how to setup the slider. 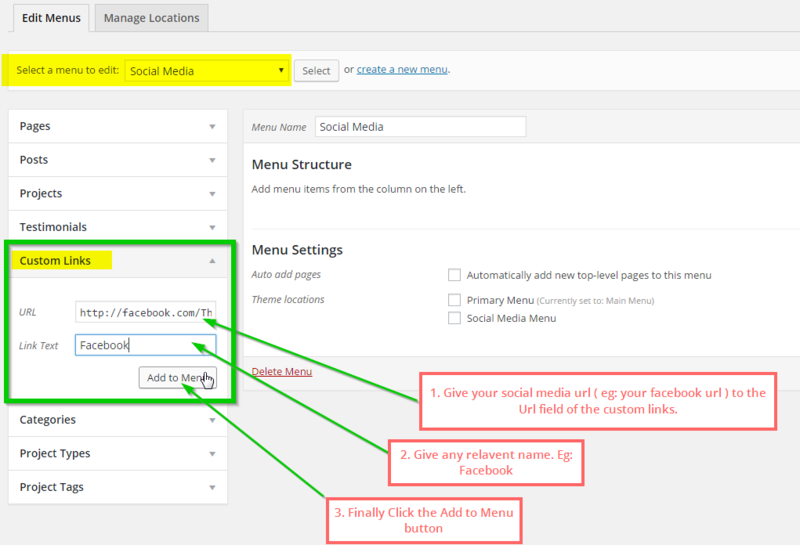 Social media menu of enliven uses normal WordPress menus. Social Media Menu displays in the footer area of the website. 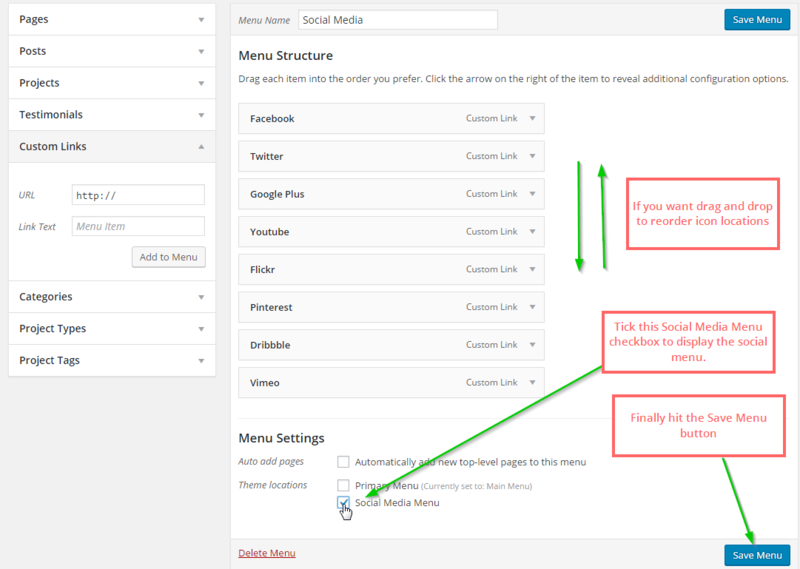 Please follow these steps to create menus. 1. Go to Appearance > Menus from the WordPress dashboard and create a new menu. 2. Then add custom links to the created menu. 3. Finally Select the “Theme Location” for the menu as Social Media Menu to display your social menu. 3. Then find the Custom Content Types module as shown in the screenshot. You will see a link called Activate when you hover over the area. Click that “Activate” link to activate Custom Content Types. 4. 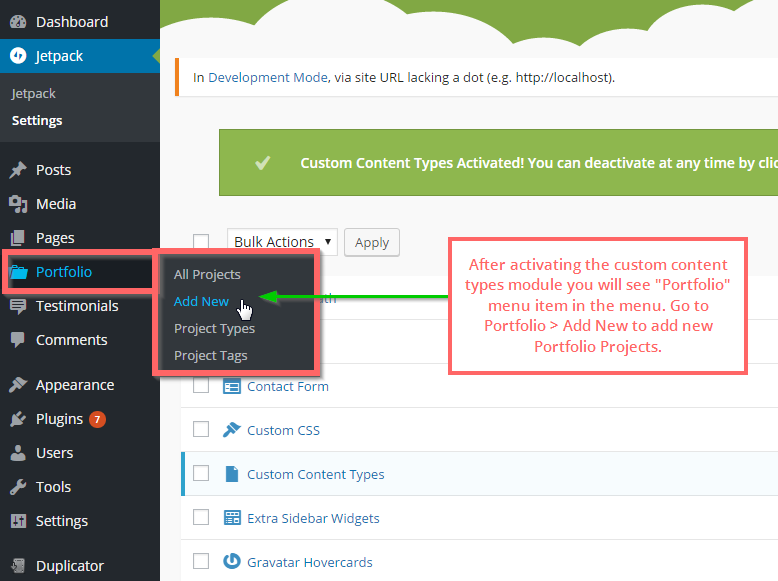 After activating the module you will see a new menu item called “Portfolio” in the dashboard. Go to Portfolio > Add New to add a new portfolio project. 6. 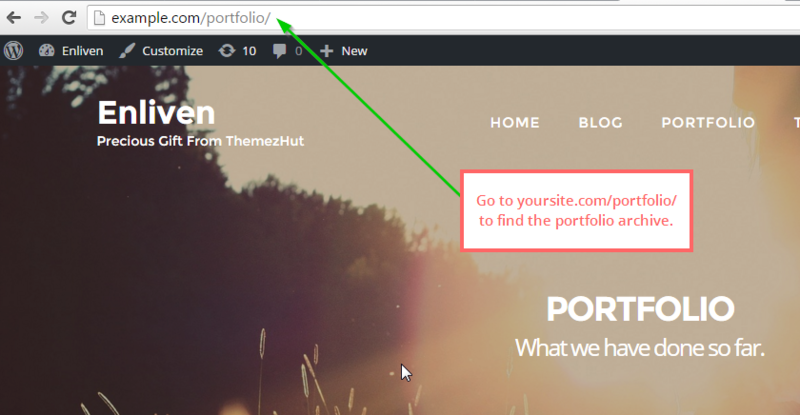 See the following screenshot to learn the number of portfolio posts to be displayed in the archive. If you followed the above first three steps of the “Activating Portfolio” section, now you can activate the testimonials also. Go to Settings > Writing from the dashboard and scroll the screen. You will see a heading called “Testimonials”. Tick the checkbox “Enable Testimonials for this site”. How do I modify the Google font on my site? Google font options available on Enliven Pro. I am trying to display the single page widget of Business Template at full width and i don’t understand that if it’s a single page widget, what’s the reason to being displayed just in one side? IWhat can i do to display a block of text + an image in the side? what’s the widget for that need? I just replied you via email. Hello, I’m trying to get the “Single Page” widget to display all the text I’ve put on the page, not just the first 70-or-so words of the content. I have not seen this question asked before and wondered if you could please help me? Actually another person also asked for this. I will update the theme for that within 2-3 days. My testimonials aren’t showing up on the front page anymore. I have not changed a thing but they are gone. Featured projects still work but not testimonials. H E L P ! ! ! In your site it shows a jquery error in a plugin called lightbox. That is why it is not showing. Deactivate the plugin and check if it is working. I’ve another question: how an i create my testimonial page ? Cause i already created each testimonials thanks to Jetpack and i can add the widget in the front page, but i would like to see the testimonials in one complete page and i don’t how to do that ? Like your page in your demo: https://themezhut.com/demo/enliven/testimonial/. Thank you in advance and thank you again for your great theme! Actually you don’t have to do anything. Just go to http://www.yoursiteurl.com/testimonial to see your testimonial. You can add this to your menu using a custom link. Thank you very much for you awesome theme! I meet a problem with my content: It’s only on the right side in my pages and I don’t know how to put it in the complete page like in your demo. I removed the widgets in the sidebar so there is a gap now to replace it and the text doesn’t fit the page. Maybe I missed to do something ? Do you want to build the front page with widgets like shown in the demo front page? If so you need to create a “Business Template” page. Read the section 5 and 6 of the documentation for more information. I just used your theme to one of my websites and it is so awesome! The only problem is when I view it on mobile, the content is not aligned in the center. How can I fix it? What happened to my contents if I want to upgrade Enliven from free version to Pro? Will it disappear? Or I must set my front page again from the ground up? Your content will not be destroyed when you upgrade. However you will need to setup your homepage widgets again. Question: how can I add a breadcrumb to all pages (except home page)? You can try breadcrumb plugins for that. Hi, I don’t want to use the slider function on the static front page. Now if I don’t use it, it leaves a big gap between the top and the first segment of the site. Is there any way I can have that gap removed? You can use custom css to change gap. However I cannot say anything without looking your site. Your site is in maintenance mode. Is it possible to show the menu on all pages? It is visible only on the frontpage. Menu is displaying on all pages. May be you have set the header type to background image and haven’t set a background image. Then it is not visible because of white text on white background. So I can display different header images for different pages (inserting the images using HTML on the page). Do you know if there is another way to do this? Different images to the header for each page, and showing the menu in all pages? You don’t have to put html to display different images. Just go to Customizer > Header Settings > Header Type > Page Header Type and select the option Featured Image. Now go to each page and set featured images for them. Those featured images will be displayed as header background images. Thank you very much for the tip, it worked perfectly! Another question: In my frontpage, I have a Featured Images Widget, with three clickable images that send the user to their respective pages. These pages have their featured images as headers, obvioulsly. Is it possible to have an image appearing in each of these frontpage’s widgets, and different ones in the page’s headers? Is there a way to remove the sidebar completely from pages? I have all widgets deleted, but it will not allow the page content to span the entire page. It instead leaves the space for the non-existent sidebar. I figured it out. Just set page templates to “Full Width Template”. God bless you! Thank you for sharing this wonderful and beautiful theme for free!! Thank you for explaning and showing everything in such an understandable and easy way ! Thank you!!! I was trying to allign my header title text and description to the left but i got stuck, how can i achieve this? That cannot be happen. This update was about to give some Color controls to the theme. However can I see your site? Could you please give me you url? I cannot say what is it by looking the screenshot. Hi! to change color of the call to action buttons or the character font, shall I need to download the pro version? Yes color and font changing features are available on PRO version. Hi there, great theme. Can we resize the call to action widget to match the image size. My image is 1247x390px. If I set a height on the call to action class, the image doesn’t fill the space. Cut off at the top and whitespace at the bottom. Hello, I’m trying to activate the front page slider (I’m following the instructions on this page), but it’s not working on my website. Is the slider available in the pro version only? Slider is available on free version too. And I haven’t checked the theme with 4.2.1. However I recommend to update the WordPress to it’s latest version. Please update your theme to latest version. Where can I find the color codes/ccs for Enliven, I want to integrate an form from an Marketing Automation software. I am quite don’t understand your question. However CSS file is style.css file. I really do want to say a huge thanks to that awesome theme and a comprehensive and well detailed explanation you put out there, I followed the steps and was amazed at how everything worked perfectly. I didnt have any hitch anywhere with the widgets I used and settings that i made. I am really happy with my result using that them. I sure will go for the ‘Pro Version’ in order to grasp the full benefits available to the pro-version. I posted a comment with some questions and they’ve been deleted. Why? Comments haven’t deleted. They were just on the queue. I am sorry for the late. I have replied to your mail. Hi, I sent a message a few days ago and haven’t heard back, so I will try this approach. I have a static home page with a slide at the top which is set to the business template as specified. I would like to simply add text below the slide (the home page photo) to describe the business in a formatted way. All the widgets I’ve tried either frame text toward the left and/or don’t display all the text and/or don’t format properly to the slide/header. Also, if I try to set other pages on website to business template so as to customize them and add widgets, etc., they add to the static home page instead of their respective pages. Please help again. I look forward to a timely response. Thank you. Page builder support will be given soon. I replied to your email. I am waiting for your reply. Thanks for a wonderful theme. Everything looks awesome but I am unable to use it only due to one simple thing. I need my logo and title to come to top right corner of the menu. No matter how much edit Style.css, there is no use. I just wanted to say this is a great theme, I’ve purchased the Pro version and am enjoying using it and loving the results. No questions, but it would be great to get an answer to questions above about optimal image size and resolution (maybe it’s answered and I didn’t see it). What resolution images have to be used as a pages’ and posts’ featured image and project’s image (portfolio)? I’d like to know excactly dimensions, because I don’t want the theme to scale it on a page. I have tested it out on a few different devices. On tablets, both Android and iPad, the featured image come up instead of the video. Perfect! However, on an android and iPhone it is a gray box with logo and menu. This is NOT working for me. Pleases write back Pubudu! I need this to work. You had not set a featured image for the page – “The Perfect Gift of The Florida Lifestyle” Now it is working as expected. I have set a image temporary. You can change it. I am currently setting up my website and I’ve got projects loaded into my portfolio, however now that my projects are loaded and showing up on the portfolio page, my header image will no longer display. It is still set as the featured image for the page and it worked before I activated the jetpack portfolio tool. Can you please tell me how to get the header image to show up again? Thanks! I also wanted to mention that I love this theme! It is pretty user friendly for a non-tech person, but beautiful. Thank you so much for the amazing template it’s really nice. I was wondering if I could increase the height for the call to action widget, because it seems a little too thin at the moment. Or if I could use a slider widget underneath if that is possible? I tried reaching out last time, but I’m not sure if the message was sent successfully. It’s better to increase the top and bottom padding of the call to action to increase the height. Paste the following code in the Custom CSS code area in the customizer. Change the current padding of the 100px to any amount your preferred. Can’t make the main page like in the demo. You can get demo data? Please read the documentation and you will be able to make it like the demo. You use ready page. It is impossible to do as you have. How can I SEO the front page when it is set to “Business”? I am using Yoast SEo and I get these about my home page. Bad SEO scoreThe text contains 13 words. This is far too low and should be increased. Bad SEO scoreNo images appear in this page, consider adding some as appropriate. Ok SEO scoreThe page title contains 11 characters, which is less than the recommended minimum of 35 characters. Use the space to add keyword variations or create compelling call-to-action copy. Having an optimized Home Page is important. Try editing the SEO data of the page that you used for the homepage. Thanks! Will do. Looooooooooove this theme! Great job! it is a fantastic theme! I have been training it on my local host and everything was working perfectly. Now I started to work on server and testimonial and portfolio does not work but I was doing everything what I had done on my local host. Might it be something with a server? First of all thanks for this amazing template! I’m trying to put the header image in all pages but with the slider area I can’t. I haven’t any image. How could you put the image of hands on the computer in the demo? First, thanks a LOT for your amazing template! I would like to ask your permission, may i use this picture https://themezhut.com/demo/enliven/wp-content/uploads/2016/03/student-849825_1920.jpg for my website for free ? No problem. It is a royalty free image from pixabay.com. Here is the link to that image. 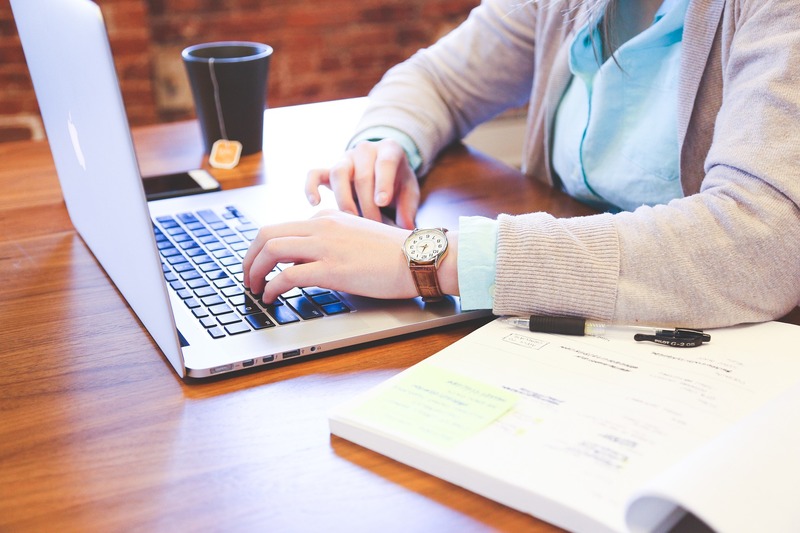 – https://pixabay.com/en/student-typing-keyboard-text-woman-849825/ You can download it from there. Thanks for the amazing template. May i know what is “grid page” template for? First, thanks a LOT for your amazing template! How do you add the ABOUT US section to the footer? I’ve created a Text widget as stated above but it doesn’t appear on the footer and it looks terrible. I have the version PRO but the button’s color doesn’t change when I select a different color. Sure I will help you. Could you please specify which button? Slider, Call to action or Form buttons? I have followed the instructions for slider on homepage. But the slider is showing small images instead of the full width featured image. May I know what could be the issue? Hey! Me again! Sorry for the 20 questions! I LOVE this theme and it is coming together well for my project. Thank you so much for this awesome theme. My next question is…. I am using the video header and it is great on the computer but on mobile version it just shows a gray background. Is there a way to just take a still image in its place? Should the video play on mobile as well? It’s totally up to the device. Enliven Pro checks if the particular device can play the video. If the device can it displays the video. If it cannot it will display the featured image of the content page you select for the slider. Please set a featured image for the content page. That’s the way you can set it. When I put contact info in bottom right footer, it won’t load my testimonials on business page now. I takeout away and testimonials come back. Any ideas? They show up when I uncheck the map. Could you please give me your url Greg? It is easy. First select to “display all page content” as the video caption. Then from the normal page edit screen you can change the text color and use different text sizes. The title also a part of the page content. It is a normal text in h3 tag. I will email you a screenshot. I’d also like to know what is the suggested size for images in the slider. I’ve tried a few different sizes and can’t seem to find the right balance. Love the theme. Just installed it. But what are the dimensions for the images for both the Business Theme Home Page Slider and for Page Featured Images. I need to resize my images. Thanks! Could you please send me a screenshot of the display issue to support@themezhut.com? thanks for your awesome theme! Just a question: is it possible to use lightbox in a post/page just as in your gallery? How? Can’t publish URL ’cause I’m working on my localhost. Hi Pubudu, I’ve been able to implement the slider well. However, all the pages that I create for the slider will appear on the header of the home page. Is there a way to hide these pages from appearing on the header? I have 4 images, but I haven’t got content to write to those 4 images, so I wouldn’t like them to appear as a link on the header. Sorry, I forgot to say thank you in advance! in the free version you propose there is also the Enliven: Portfolio … I do not see the widget? In the description of the thema page it is clearly shown that there is also the widget Portfolio. Where can I find it ? Portfolio works in the free version also. You need to activate the Jetpack’s Custom Content Type module to activate it. Please read the theme documentation for more details. I just purchased and downloaded the Pro Theme. It appears to be great. I’m really looking forward to it. I have just started customizing it but have run into a bit of a problem. I’m sure it’s simple but can’t find it on my own. My blog posts do not show up on their individual pages. They do show on the Blog list page but not individual pages. I’m not sure what setting I may have changed to cause this. I have replied you via email. Hi. Thanx for great job!!! Tell me please how can i put back to top button? I really love this theme, just one question: can I set a background image for a category? I am sorry currently it is not possible. However I will try to give that feature. First of all, this theme is just great! Keep up the good work! However I am unable to configure the portfolio page. I created a new page using the portfolio template, I added a few portfolios, but on that page I can’t add a header image or use a good layout. The portolios are displayed but the menu is not visible since the background and the menu text color are white. Portfolio page template is only for when you need to make a portfolio homepage. To make a portfolio archive page as shown in the demo just add portfolio items from Portfolio > Add New and go to http://yoursite.com/portfolio/ to view the archive. Please read the documentation for more details. Hi, off the bat let me just say – great theme!!! Thanks!! 1. How do I get a post to show up on the blog page? – In settings – reading – I have set to 10 posts – yet only the demo articles show up? Thanks again!! – it really is a precious gift you have made available!! Hi, i would like to buy this themes but i dont find any documentation about modify the video in home page. Is it easy to customize? Another Question… can i hide some section, for example i dont want show the THEME FEATURES section. Yes adding a video is from the customizer. All customizer settings are self descriptive that’s why it is not included in the documentation yet. And yes you can hide any section or reorder any section you want. All those sections are widgets. So it is very easy to customize them also. Why does the mail icon “social media” appear as a square icon. Suggestions to correct? Can we customize the positions, size or font of “text” boxes for the slider pages? Currently I’m developing on my native system. I re-did the slider steps and it worked. I want to use the feature Slider. I followed all the steps given in the Documentation but as said the option isn’t visible. I tried to reinstall the plugin Jetpack as well as the Theme itself. Unfortunately, I’m not not able to figure out. Did you selected to display the slider on front page from “Front Page Settings”? Yes I did enabled ” Slider ” option from “Customize” method. Also I did set “Featured Images of Pages” I want. But I’m not able to figure out the solution. I am having issues with the site. I am not a coder or a web designer, just a regular old person so I am having multiple issues. First, I cannot get the site to show an image as the first thing like on the demo website image. Also, I too cannot get the slider to work. Can you help? When I select anything other than blogpost for the static home page (I’ve created new page ‘home’, and selected it as static home page) it gives me a blank page. Please don’t use static home page for blog posts listing. By default it is listing blog posts on home page. If you want a “Home” link in the menu just create a “Custom Link” from menus called home and link it to your site’s url. Yes I saw that. I will fix it in the very next theme update. Hi Pubudu! Really great theme! Awesome. – Is it possible to change slider speed? Slow down a little bit? – I think there is one problem with centering text at “middle part of slides” (neither first slide and nor last one slide – but 2nd, 3rd etc. its depend how many items you have in slider). Text inside “Middle part of slides” (for example: 2,3,4) is not centered – its a little bit from right side. Text at “Outside part of slides” (1st one and last one) are OK, its centered. Do you confirm, it’s a problem – or only on my page is it? I’m not sure. I am sorry. Currently it is not possible to slow down the speed directly from the backend. Yes I will fix the mobile issue. It could be because I was using a kind of portfolio plugin. I will try desativate as soon as possible. Im very grateful for your attention! I couldnt find the testimonial and portfolio widgets in the widget list? You should install and activate Jetpack plugin first. 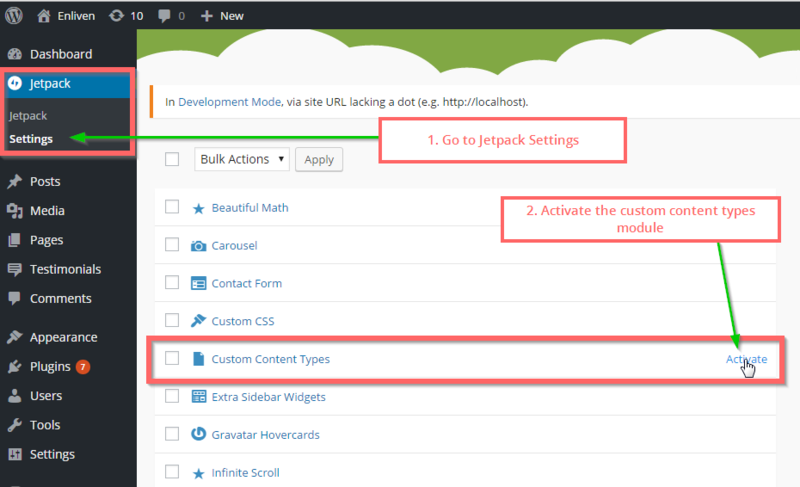 Then go to “Jetpack > Settings” and activate the Custom Content Types module. Then from WP dashboard “Settings > Writing” activate the testimonial content type also. Hi, what is the optimal picture size for the slides? Height/width in px? There is nothing about Portfolio Page in the documentation. Can you help me? If you have activated it you will be able to see a menu item called “Portfolio” in the dashboard. That’s the place where you can add portfolio posts. Add two three posts from there with featured images. Then your portfolio archive page can be found by going to http://www.yoursiteurl.com/portfolio/ . Please replace yoursiteurl.com part with your website url. I think this will be help you. This is a beautiful template. Commendations to you and the team. I love it. In order to use testimonial widget you should install Jetpack plugin and activate the custom content type module (Jetpack > Settings > Custom Content Types). Then activate Testimonials from Dashboard > Settings > Writing. Hi! It’s true, the sliders on the front page aren’t working!! What can I do? I need a solution! They are working perfectly. Try it out reading the documentation. The sliders on the front page aren’t working. Do you have a video showing how it’s done? To create slides, please create pages with featured images and select those pages for slider from “Appearance > Slider”. Then from “Appearance > Front Page Settings” tick the “Activate Slider” checkbox to display slider on front page. If you want to display this slider on Blog Posts listing page go to “Appearance > Blog Settings” and tick the “Activate slider on blog” checkbox. Yes I am gonna make some video tutorials for enliven theme. The sliders on the front page aren’t working,either.i need some captures about that way. I will make a video to teach how to configure the slider. Is it possible to put video on slider / instead of slider ? I am sorry. Currently it is not possible to put a video on slider. thankyou,Pubudu.The sliders on the front page start working. please teach me how to make the black footer area(that contains “ABOUT US”,”RECENT POSTS” and “RECENT COMMENTS”) on the front page in the demo site. what kind of widget do you use? I have used following widgets. About us – “Text” Widget. Recent Posts – “Recent Posts” Widget. Recent Comments – “Recent Comments” Widget.